In Romania, the educational and cultural policy regarding equal access to culture of visually impaired people was limited only to a few initiatives, implemented mostly in Bucharest. In Dobruja, there is no museum institution that has facilities to enable people with visual impairments to interact directly with the cultural heritage, although in the entire Constanta County there are 1937 people registered with visual impairments, of whom a significant percentage - 37% is represented by children. Sheltering an invaluable cultural heritage, not even one of all 6 museums (Constanta, Callatis, Histria, Adamclisi, Cernavoda, Harsova) has proper arrangements (directional pathways, audio devices, informative materials written in Braille) allowing this target public to come into contact with valuable cultural treasures. Moreover, the educational role of the Museum can not be fulfilled for this category of public, due to the lack of these technical facilities, informative materials, educational programs and the specialized staff of the museum (guides, curators) does not have the proper training to work with people with visual impairments. This is why MNHAC, in partnership with the Association of Visually Impaired People in Romania – Dobrogea branch (from now on AVIPR – Dobrogea branch) and with Callatis Cultural Complex, submit a pilot project for this region, in order to facilitate access to heritage for this category of public. Although the project will be developed over only one year, collaboration between the above mentioned partner institutions, as well as the support granted by the General Directorate of Social Assistance and Protection Constanta, will enable the implementation of a coherent cultural policy in the following years, to meet the real needs of this target group. As one of the oldest and largest cultural institutions in the country, MNHAC carries out its activities in south-Dobrujan region through its cities, sites and museums in Constanta, Cernavoda, Adamclisi, Histria, Carsium-Harsova and Ulmetum. Therefore, the project will be developed in the South-East Development Region and will include the following cities: Constanta, Mangalia (partnership with Callatis Cultural Complex), Cernavoda, Harsova, Adamclisi, Histria. Also, based on the partnership with the Association of Visually Impaired People in Romania - Bucharest, the project will benefit from dissemination at national level, following that all promotional materials to be distributed free of charge to all branches of the Association of Visually Impaired People in Romania. Project goal is to facilitate access to the historic and archaeological heritage of Dobruja for people with visual impairments by increasing the visibility of their cultural and educational needs. 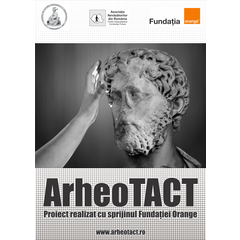 The project, which is developed based on a sustainable partnership between MNHAC, Association of Visually Impaired People in Romania and supported by the General Directorate of Social Assistance and Child Protection Constanta, will implement in the museums the infrastructure specific to the targeted group, will allow a direct contact with the exhibits and cultural assets and will provide for the children with visual impairments the chance to actually participate at the educational and cultural activities carried on by the museums involved.